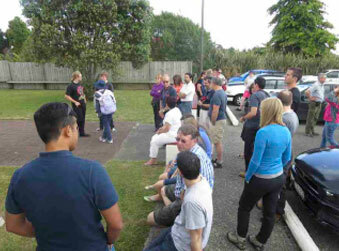 Crowd just arrived and waiting for admission in the Te Takinga Marae after a welcome ceremony (pōhiri) to meet the community of Te Takinga Marae. The Marae is a sacred place where a local Maori community lives honoring its legacy back to the founding ancestors, but also looking at the challenges that the future will offer. This legacy is shared with visitors after a pohiri ceremony. During the pohiri we introduce ourselves declaring who we are, our mountain, our lake, and our ancestors. This is concluded by sharing of breath and touching our noses (hongi) to became part of the community forever. We are now admitted to the sacred sleeping quarters that will be our new home for the duration of the expedition. We will have meals together and sleep together in the marae (sorry, no pictures allowed! ).